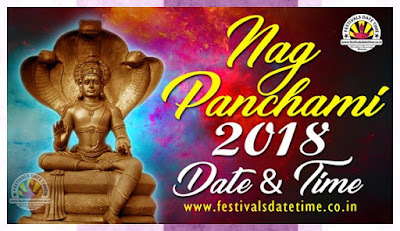 About Nag Panchami : Nag Panchami is a traditional worship of snakes or serpents observed by Hindus throughout India and also in Nepal.The worship is offered on the fifth day of bright half of Lunar month of Shravan (July/August), according to the Hindu calendar. The abode of snakes is believed to be patal lok, (the seven realms of the universe located below the earth) and lowest of them is also called Naga-loka, the region of the Nagas, as part of the creation force and their blessings are sought for the welfare of the family. Serpent deity made of silver, stone or wood or the painting of snakes on the wall are given a bath with milk and then revered.